In an age of austerity, at a time in which industrial struggle seems to be on the agenda in a way in which it hasn’t been for years, activists are asking questions about unions. What can we expect from them? How should we relate to them? Why are they as they are? Originally published in May 2011. Movements tend to reproduce their own social base and subjectivity according to the tactical repertoire which constitutes them. The things they do determine who takes part, and who takes part determines what they do. Thus, a movement based around students, unemployed people, NGO workers, and those with jobs that allow them a high degree of personal flexibility, tends to reproduce itself based on a set array of actions: camping, occupying or blockading commercial property, street-theatre, banner drops, etc. – with an apparent diversity, but all a characteristic response to the lack of a mass social base rooted in contexts of everyday experience in which non-activists can be mobilised for . . . action. The ecological anti-capitalist movement has largely been constituted outside, and to an extent, against, work. It has not therefore, often, found itself with plurality of militants at a single workplace, or in a given industry, who need to, or who could, struggle within that context. Where the movement has had such a plurality; there is quite probably little or no collective awareness of that fact, and there has been little or no effort to bring them together, or support them. Their social position has not been seen as a potential tactical lever by the movement as a whole, and perhaps not even by the workers themselves. Therefore, the movement tends to relate to workers’ struggle, and therefore to unions, as something outside itself. When activists need to get normal jobs in large workplaces – and they show enormous creativity in not doing so – they often leave the movement; particularly if they also need to put time into a family. So – as in the case of debates over open cast mining, or coal-fired power stations, unions appear as an external ally or adversary: not something we’re part of. Just as there is, in general, no useful revolutionary theory not based on revolutionary practice, there is no useful critique of trade unionism which does not rely on, or imply, a practical project to supercede unions in practice. That is: cheering or denouncing unions, whether from inside or outside, is wholly sterile. Even a nuanced critique, which understands the countervailing dynamics of the union form (how they express class struggle; how they hold it back) is somewhat sterile, unless it is linked to practice. Such a nuanced critique is nonetheless necessary. 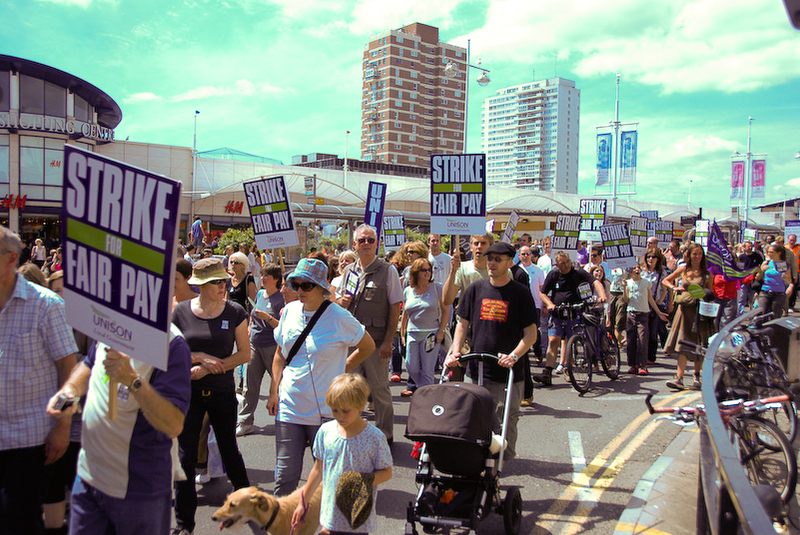 Unions, in Britain today, seek to bargain with employers over workers’ terms and conditions and are based on a mass worker-membership. They are stable institutions, persisting through occasional disputes, and rather longer periods which see little conflict at all. From these facts, a number of dynamics follow. Firstly, unions appear as an expression of workers’ self-organisation, and reflect, to an extent, workers’ opinions and perceptions. However, they are also better adapted to compromise – which is what they spend most of their time doing – than they are to struggle. As permanent institutions based on a fairly passive membership, they acquire a permanent administrative staff and a leadership to run them – what is often called ‘the bureaucracy’. In the absence of permanent industrial warfare or revolution, they need to be able to compromise with the employer. And therefore they also need to compromise with the state, which seeks to regulate industrial relations through a legal framework which appears to offer a proper procedure for industrial action, but without making it too easy. Thus, over time, unions develop an institutional interest in capitalism, and a symbiotic relationship with the state. In the UK, this relationship is expressed partly, but not wholly, through the unions’ support for the Labour Party. However, this process is not something entirely apart from workers. The mass of workers themselves accept capitalism and the state, and it is their lack of willingness to engage in relentless anti-capitalist struggle which provides the basis on which unions are founded. So, all is well between workers and unions? Not at all. Typically, the leadership of the union has a greater interest in compromise than the base; a fact which is often exposed when workers decide to struggle. They probably weren’t all that interested in the union when it wasn’t organising struggle, but when they do engage, are confronted with an organisation which has become more suited – in terms of its form and leading personnel – to compromise than the sort of action they want, or need, to win. Just as workers seek to organise through their union, they also discover a conflict with the official leaders, structures, and rule-book. These dynamics also affect the nature of trade union demands. Not only are the demands not revolutionary, they very rarely move beyond wages and redundancies, to question the content and nature of work, and the place of the worker within society as a whole. Unions are therefore best understood as the expressions of two countervailing dynamics. On the one hand, unions are a basic form of workers’ self organisation against the day to day predations of capital; they express – albeit in a very staid manner – the class struggle. On the other, unions are institutions which seek to control and limit that very self-organisation, limit the militancy of its members in pursuit of that aim, and limit the scope of demands they raise. These tendencies are both so strong, and so integral, to unions that it is rare that one entirely wins out. The extent to which one prevails over the other differs from time to time, and place to place, depending on the circumstances. Most Trotskyists identify the struggle over work precisely with the trade union struggle; and attributes the failings of unions in large part to a ‘crisis of leadership’, which can be solved by themselves being in charge. They are probably also officially in favour of democratising the unions, and will generally support unofficial action. Trotskyists generally accept that unions are ‘not revolutionary’ (the remnants of a critique of trade unions which was common in early 20th Century Marxism), but rarely have a general structural analysis, such as the above. They do not, typically, prominently raise the possibility of struggle beyond the unions. The orthodox ‘ultra-left’ position adopts the opposing view. Rather than seeing unions as institutions ripe to be captured and redirected by revolutionaries (and implicitly free of a structural relation to capital and the state), they see unions solely in their aspect of a limit to the class struggle. This, at its worst, results in a total disengagement from trade unions, and a tendency to denounce every defeat of the working class as evidence of ‘union sabotage’. There is little acknowledgement that workers organise class struggle through unions, still less that workers often choose to end disputes themselves. Blaming ‘the union’ posits a bogeyman, wholly external to the workers’ movement – and prevents serious engagement with the subjective and material sources of workers’ interest in compromise with capital. It also lets us off the hook: given that we have failed to build support for our ideas – direct action, participatory democracy, anti-capitalism – don’t we have cause to take a hard look at ourselves? A third position, which is often held implicitly but very rarely expressed, is that of critical routineism. Many libertarian activists who are formally critical of both perspectives are involved in their union because they want to do what they can to oppose day to day injustice. They don’t necessarily want to take over the union, and are aware of the limits of trade unions, but neither do they have a clear idea of how to go beyond it. Often, the union will take up alot of their energy, not leaving much time for extra-union-routine politics. Whilst individually critical of unions, their day to day activity doesn’t move beyond trade unionism. Earlier in this article, I argued that the lack of an independent libertarian revolutionary practice in relation to work was not only a product of our movement’s sociological isolation, but a cause of it. We’ve seen that unions are the crucible of countervailing dynamics, which express class struggle, just as they stifle it. We’ve seen that trying to take over trade unions is likely, in the end, to be as futile as denouncing them from the sidelines; and as unlikely to develop an anti-capitalist dynamic as individualised routine. What does that leave? Loren Goldner calls it ‘extra-unionism’: “be in the union, be outside the union, but your perspective is beyond the union”. But how? There are no easy answers. But it’s possible to suggest a few different approaches. Industrial networks. At present, our movement makes no serious attempt to ensure that militants working in the same job or sector get together to organise collective work. A first step would be to make it part of our regular practice that health workers and education workers, for instance, meet in fora such as the Anarchist Bookfair. Discussing perspectives for organising solidarity and agitation could form part of this. Solidarity unionism. In the US, the IWW has developed a workplace organiser training which has been taken up and adapted by the Solidarity Federation here in the UK. The purpose is to train workers how to build collective confidence and power on the job, without relying on official structures or mediation. In the US, the Starbucks and Jimmy Johns workers’ unions have been two important consequences of this approach. We need to stop thinking of ‘direct action training’ as based on a discrete series of skills, such as lock-on and tripods, but instead about we involve non-politicos in direct action. Contact SolFed if you’re interested. Base groups and bulletins. In the 1970s, libertarian socialists in Big Flame and the early International Socialists adopted an effective organising model. It was particularly well suited to large factories, but there may be a way to apply it today. Militants based inside and outside the workplace would work together to produce a regular workers’ bulletin, designed to reflect the experience of work and struggle, and help workers communicate with each other. Rather than laying down ‘the line’, at their best they’d show the radical implications of being honest about our working lives, and provide a way to organise politically at work, without relying on the union. The support of outsiders was often necessary due to the pressure of work, family-life, and union activity. Workers and service users: in and against the state. Cuts are attacks on service users and workers. In the late ‘70s, another period of public sector cuts, workers and service users found ways to organise to support each other, in a way that cut against the capitalist logic of the state sector which divides the working class against itself. These attempts are documented in chapter 6 of the book In and Against the State. We live in an economic and political reality very different from the high points of class struggle, characterised by mass expressions of workers’ autonomy. But, once again, workers are in the front line. Where will we be? To find a way to answer this in practice will require ingenuity and experimentation. But unless we learn to speak with our own voice, we will never be heard. And if we are never heard, we might as well be mute. Why would any "pro-revolutionaries", whose primary task must be to support the unity of the working class, want to support or stand up for organisations whose main task is to keep the working class divided amongst itself? The "tendencies and counter-tendencies" argument is a diversion since the main tendency overwhelmingly outweighs and overpowers any sort of counter-tendency. I don't think that one can use the dialectic to bring the dead back to life. There's volumes of stuff on here trying to prove that there's some sort of life, something, anything to be supported in various national liberation struggles. One recent one was how the murderous Vietnamese regime was "better" than the murderous Cambodian one - there's always a lesser evil, always something to justify working class support - it's what leftism feeds on. In 1919 in Russia, the unions came to the aid of the state in helping to crush the factory committees, the last and only hope of the revolution. The unions continued with this work into the early 20s. Even in revolutionary Russia the unions defended the interests of the state against working class organisation. And since, the unions everywhere, have the fundamental role of being against the working class and defending the national interest and no amount of dialectical spin will alter that. i'm not talking about national liberation, although i suppose it is easier to have the same analysis of everything regardless of its concrete content: goodie or baddie? so 'the unions' are an abstraction across time and space? the idealism thickens! this is straight out of Plato, in the name of Marxism. Well since you put it like that, we'd better get rid of that abstract call to 'smash the state'. Do you just not follow the argument? Because if this is an honest misunderstanding I'm happy to explain it in simpler terms. Do you just not follow the argument? Certainly not just 'follow it' - I've tried to participate in it. You try not to be so supercillious. But by all means, please explain the central thesis of Tom's arguement about the movement and trade unions in 'simpler terms'. It seems like only the conclusion (5) is in dispute. Possibly also point (4) is in dispute, which is what seems to be being dismissed by the platonic idealism: 'you can give examples of successful union struggles, but these are irrelevant to the true historic role of the unions' (i.e. it doesn't matter what examples are produced, the theory has been deduced already and, as the essence of 'the unions' is known - their historic role - no mere concrete example can contradict it). Thank you. Pause (on my part) for reflection. I'm not used to university type discussions JK so I appreciate your concern to cut the sarcasm and keep it simple. I know you wasn't talking about national liberation - I was. I was talking about it because the same fundamental anti-working class position as that of the unions is defended in saying, yes there's something, however small in defending these structures - in this case, say, Vietnam's government against Cambodia's regime, because one has killed less people than the other. Or you could support the former because it's given one more grain of rice to a worker than the latter - in that case there is something positive to it. Forget the fundamental counter-revolutionary nature of the nation state, this state in relation to that state, by dint of a grain of rice to one worker has to be better for the working class. Down with the state JK, down with the national state and long live internationalism! The role of the unions is even more clearer to me than that of the nation state - indeed they are part of the same nation state. Trade unions haven't always existed as you probably know. They have a history in a similar way to the nation state. They have developed from organisations of the working class to their integration into the needs of the nation state and its defence both economic and imperialist. That a worker gets a grain of rice from the trade unions makes not whit a difference to their function as statist organisations, dividers of the working class and funeral directors of the class struggle. Are you surprised that the unions in the major countries are involved in workers' struggles sometimes initiating them. Why would that contradict anything about the unions being against the working class? What do you think that their role is?. Look at the unions in China who have opposed the class struggle - what good are they for the Chinese state? Of course the unions initiate struggle that, among many other things, is part of their role. Unions like those in the People's Republic wouldn't be any good for the British, French and so ruling classes. For you, on the one hand the unions have a statist role and on the other are an expression of the workers' struggle. For me the overwhelming evidence of the last hundred years of the trade unions is one of integration into the capitalist state and the defence of that state's national interest against the working class. I know you wasn't talking about national liberation - I was. Yeah, it wasn't JK who introduced the juxtaposition of 'national liberation movements' with 'unions', it was me. I did this because it was JK who, with others, convinced me of the anti-NLM argument, and I wanted to test the argument that the two types of organisation which contain workers had similarities. Could the amended quote be just as valid as the original? I (and I presume baboon and Lurch) would answer 'Yes, it's valid to align the two together, and conclude that the statement is wrong in its conclusion'. Whereas JK would see it as invalid, but still hold the original statement is correct. I'm sure you know enough philosophy of science, JK, to reflect that your hasty criticism that "it doesn't matter what examples are produced, the theory has been deduced already and, as the essence of 'the unions' is known - their historic role - no mere concrete example can contradict it" is an incorrect criticism, and it is an entirely scientific approach, according to Lakatos, for example, and is not an example of 'platonic idealism'. For me the overwhelming evidence of the last hundred years of the trade unions is one of integration into the capitalist state and the defence of that state's national interest against the working class. You're right, JK, all the 'concrete examples' of 'union wins' in the world can't contradict the theory. But then, the theory is also based on some countervailing empirical evidence, like the General Strike. As I've said all along, it's a judgement. And your outlining of the anti-NLM argument, which helped convince me, has also helped me to form this judgement. LBird, I’ve been back and read your references to likening the union question to the national liberation question and generally agree with your line of march; ie, “positives” can be taken from both in national contexts but an internationalist position can only be against both. I’m taking a bit of a liberty and want to reproduce (pre-publish rather than unpublish) a quote from the second part of text on class struggle in Africa that I’m translating for the ICC (the first part is on its website) made by a historian who has studied the subject. It’s just one point and no doubt there will be those that say that this is just another example of listing what’s deficient in the unions; that it’s another example of intransigence and vulgar proletarian obstinacy – which is exactly what it is. In the 50s, 60s and 70s, in the labour camps of Russia, East Germany and other Soviet bloc satellites, all the workers were in unions and from this basis extremely important class struggles broke out. That doesn’t mean that labour camps have “counterveiling” tendencies within them (though this may be more difficult to see with the democratic trade unions). Dialectic materialism has been mentioned above with someone kind enough to show a picture of a coin so that us dimwits can see what’s meant by two sides. This presumably means that a dialectical approach to the unions understands that it’s not one thing or the other but a “dialectical” mixture of both. I think that this shows a misunderstanding of dialectics and an even bigger misunderstanding of dialectical materialism (for me the real essence of marxism). There is no need at all for revolutionaries to trap or make excuses for workers in a trade union consciousness or of trade union consciousness being a possible stepping stone to wider and deeper struggle. To talk of “alienating” the working class by taking positions against the unions is to contribute to the enforcement of a trade union consciousness. But what, from the point of view of dialectics, the workers believe in at a particular moment is not the point. Whether the working class is aware of it or not there is a necessity for a different order and, dialectically, the state of things will inevitably break apart. For marxism the most profound expression of dialectics is not something as trivial as two sides of a trade union coin but the negation of the existing order and the proletariat as a revolutionary class and the bearer of communism. Where do the trade unions, with their structurally divisive activity and constant defence of the national interest stand in relation to that? I see no substantial difference between the opposing tendencies in trade unions’ position and that of the “critical” position of the SWP. Anyway, I’ve got sidetracked and the quote is from Iba Der Thiam and his “Histoire du Movement syndical africain 1790-1929” and concerns a mass strike involving the Dakar region that broke out against the colonial power France in early 1914: “It was an economic strike certainly, but also political, a strike of protest, a strike of sanction, of reprisals, decided upon and put into effect by all the population of Cape Verde... The strike had a clearly political character and the reaction of the authorities was something else... The administration was both surprised and disarmed because it had nothing like the classic union organisation with offices and rules on the ground. This was a general movement taken in hand by all the population and whose leadership was invisible”. How can there be any doubt nearly a hundred years on, with one “betrayal” succeeding another, and the daily work of division and their function as state organisations that the trade unions are against the working class? Is there a direct analogy between "national liberation movements" and "the unions" for the purposes of this argument? First of all, although I've agreed with everything JK has said on this thread so far, I think we may disagree on this. I think, for example, that there is some real, positive and important content to, for example, mass struggles in Palestine against the separation wall, and against the occupation. On that level, I think JK may agree - but we might not describe it theoretically in the same way. In general, I don't think that "national liberation movement" is a particularly helpful term for analysis, insofar its not clear whether it includes mass struggles such as I describe as well as Hamas, etc. I would prefer starting with a more specific analysis: talking about the role and structural significance of the mass anti-colonial struggle, the post-colonial pseudo-socialist or Islamist militia, etc. (I don't think we have to end up endorsing any of these to make it worthwhile disaggregating them.) But anyway, leaving that aside for now . . . we can continue that discussion on the thread below the review of Against Nationalism if people want to. 1 - participating in Hamas is (to polarise) political, whereas participating in the RMT is to participate in a diverse organisation with political plurlity and freedom to organise for one's views without expulsion. Gorter says something like "every union . . . is a party, for or against the revolution". And, true, we are polarising: every organisation lies somewhere on the line between politically restrictive on the one hand, and pluralist and based on mass participation on the other - and at times of revolution, such as Gorter was talking about, the political role of the union may become extremely important and sharply posed, overwhelming its pluralist mass basis. The general difference in quantity, however, amounts to a difference in quality (thx Engels) in this case. In those countries where union are organised more politically (France, Italy, Spain), this is less true, but still true enough to be important. It would be less true again of a mass informal anti-colonial struggle . . . but again, still true enough to be important. 3 - The extent to which Hamas fucks people, and the class struggle, over massively exceeds that of the RMT. Suicide bombings and beating demonstrations off the streets are not analogous to not, I dunno, not calling for an indefinite political strike for communism, or failing to absolutely win every economic battle outright, or whatever you want them to do. There are other differences. The level of open democracy, the fact that the RMT's weaknesses are in part expressions of the weakness of the class, etc. etc. These differences are not incidental to the particular example in question, which I have chosen because it is easy to illustrate: they are structural reflections of the different roles which unions in the old industrial bastions of the core and national liberation movements in the oil-producing periphery play in world capitalism today. Forgive me, but aren't you in favour of a communist party? I forgive you Posi, but I don't know what you're talking about. If you're suggesting that in some way I support the CCP then you haven't understood a word I've said. The dialectic is used above to demonstrate that, because there are two sides to a coin, unions can have a proletarian context. My problem with such a methodoligical approach is that such a "theory" can apply to anything where workers are involved: national liberation, imperialist war, popular fronts, united fronts, socialist paradises, anything becomes anything in this abuse of the dialectical materialism. Yeah, this was my key question to Alexander Roxwell in our debate about National Liberation Movements, and it's my key question now, regarding the unions. Perhaps there is a satisfactory answer which differentiates NLMs from unions, but if there is, I'm yet to hear it. As I've said, the argument against NLMs seems to me to be completely applicable to the argument against unions. LBird - Well if it's the key question, then the key answer is above. Why don't you engage with the differences I set out? Baboon - my point is that it's ridiculous to use the experience of a state labour front like the official unions in China to denounce every other union in the world. Just because something is described using the word 'union' or 'party' doesn't make it identical to every other thing described by the same word. LBird - Well if it's the key question, then the key answer is above. Why not give me the 'one-line answer' then, to a 'one-line question', rather than spend your 'line' telling me to look amongst your 'several paragraph' post? Do you think this is a game? You don't seem to want to engage seriously, and would rather play childish tricks. I'll do it for you, eh? This assertion, though, is at the heart of our disagreement. And even if it is true (fully or in part), does it go far enough to justify Communists supporting unions? The essential point about 'overtly' state unions in China today (or in the old Eastern bloc) is that they are useless for controlling struggles, which is why the ruling class elsewhere expends so much energy in trying to persuade such states (usually under the guise of 'human rights' campaigns) to adopt western-style 'free' trade unions, along with other 'democratic' safety valves. That's why the UK bosses paper the Financial Times in a June 2010 editorial (at the height of last year's strikes in factories like Honda) argued that what was required in China was 'free' trade unions which could prevent such struggles from reaching the point where production was halted, quality wrecked and continuity of supply threatened (western firms haven't invested squillions in 'low wage' economies just to see their production fucked up). That's why, since 2004, a TUC delegation has visited China twice (and hosted one return visit) in a bid to push this process along - all facilitated by the same British ambasadorial team that arranged Cameron's sales junket earlier this year. That's why the US, when re-writting the constitutions of defeated Germany and Japan in 1945/46, insisted on strong trade unions (and co-opted a top US union official to oversee this process). That's why so much western support was given to Solidarnosc in Poland, the movement which took over the workers mass strikes and assemblies in 1980/81, and eventually, after the fall of the Wall, provided much of the first 'free' Polish government. Because it takes more than 'one line' to answer 'the' question, and I 'already answered' it. Are 'you' serious? I'm not sure. But if it is, it's not much fun. It is true, definitely. I was referring specifically to the RMT, just because it's an easy case study. It is simply not credible to say that the higher wages and job security of RMT members on the tube, for example, compared to others, is nothing to do with the strike action which has been organised through the RMT. That would be nonsense. Sorry. In general, if you google 'union wage premium' then you can see statistical estimates for the impact which union membership has on earnings, which tends to be between 10% and 25% in the US and UK. "Communists supporting unions" is a totally meaningless phrase. Communists participating in unions, certainly. Well, that's the assertion. Let's look at the evidence. I was referring specifically to the RMT, just because it's an easy case study. It is simply not credible to say that the higher wages and job security of RMT members on the tube, for example, compared to others, is nothing to do with the strike action which has been organised through the RMT. That would be nonsense. Sorry. Well, I'm not (and I don't think the others are, either) saying that "higher wages and job security...[are] nothing to do with the strike action...". In fact, I agree with you: they are the result of strike action by a union. "can 'higher wages and job security achieved through union struggles' in themselves be categorised as either 'class conscious' or 'leading to Communism'?". It seems to be an 'open and shut' case. Yes, workers are 'better off', through struggles in which they have taken at least some part, so we conclude that 'unions' are of some use to workers. But, can't the same argument be used about National Liberation Movements? It seems to me that at least some NLMs have lead to workers of the 'liberated nation' being materially 'better off' than before the struggle. I'm sure that this would be the line of argument which would be taken by Alexander Roxwell, in his support for NLMs. I suppose what I'm asking about is, how do we define 'class consciousness' and 'leading to Communism'. Surely there has to be more evidence than just 'workers being better off', because that can be achieved within the capitalist system. And even if the system starts to break down, the mere fact that improvements have been achieved in the past by their peaceful union-based struggles within the system, could lead workers to defend that 'proven' system, rather than launch into the unknown of 'class struggle' and 'Communism'. So, the question remains, still undecided by the 'evidence'. Are the 'unions' a valid tool for workers to develop 'class consciousness', or are they a 'bait' (like the birdseed analogy), which lead to uncertain tactical victory, but certain strategic loss? Once again, I say 'It's not clear, it's a judgement'. Let's discuss it like Communists. although you can argue that there's a counfounding variable behind the correlation: workers' willingness to take collective action which tends to lead to higher union membership and better pay. it would be interesting to see a breakdown by threatened or actual industrial action vs pay premium; i'd imagine non-striking unions come out bottom, the RMT near the top. so it's not union membership per se that's causal, but willingness to take collective action. of course most of that action is organised by or through trade unions. Noam Chomsky interviewed by Stephen Shalom and Michael Albert on military intervention in Libya, originally published on Znet in March 2011.